When examining the issue of predictability, it becomes fairly obvious that there are two important axes to consider - the predictability of what and the predictability of when. 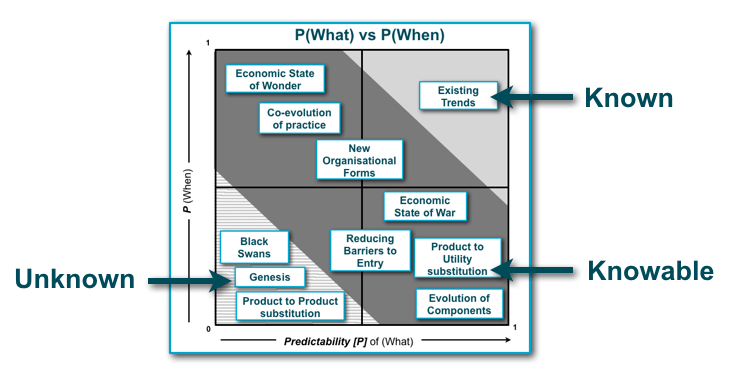 By examining change on these axes (see figure 1) then one pattern becomes clear - there is more than one form of disruption. The Unknowable (e.g. product to product substitution). In this form, a change in the value chain (caused by some new component added to the product e.g. size) is unpredictable. The entrant has no idea whether it will be successful nor does the incumbent. However, the incumbent has inertia caused by past business success and if the change is successful then the speed of adoption tends to be non-linear. This means the incumbent has little time to react, lots of inertia to overcome and is unsure whether the change will dominate. Once they realise the change is inevitable them then it's usually too late to do anything about it. This type of disruption can only be accurately seen post event and in this case, Jill Lapore is correct that disruption is a post event classification and unpredictable. The Knowable (e.g. product to utility substitution). In this from, the change is highly predictable and can be prepared for many years (or decades) in advance. Cloud computing fits into this category. This predictable disruption can be determined pre-event but for the same reasons this can defended against and shouldn't disrupt. The incumbent will have inertia but they also have plenty of time to prepare - from years to decades. The reason why incumbents become disrupted is due to one of two variations. The first variation is that the change is usually unseen due to poor situational awareness & scenario planning on behalf of the executive. Less than 30% of companies have any form of scenario planning and less than 4% have any means of visibly seeing the landscape, hence such blindness is rife. In this scenario the incumbent fails to prepare for a predictable change and suffers the same consequences as though the change was unknowable. For an attacker, this is highly attractive as the change is highly predictable and therefore a new entrant can target a space with a good degree of certainty of success. If you can find a product to utility substitution for which all the weak signals indicate it is ready to happen and which incumbent executives show low levels of situational awareness ... well, it's like stealing candy from a child. For extra icing on the cake, you can often use incumbents inertia against them. This is how Canonical managed to walk in and help itself to the entire future cloud market against the vastly better resourced and funded competitor of Red Hat. The second variation is that the change is seen but the incumbent still fails to act. In some cases (quite rare) this failure to act is due to extremely strong and entrenched inertia to change. This is what happened with Blockbuster vs Netflix - Blockbuster saw the change, was first with video online and on demand but completely failed to deal with the inertia cause by shops. The same happened with Kodak - first in with DSC and online photos but failed to deal with inertia caused by its analog fulfilment systems. Not seeing a predictable change (due to poor situational awareness) is a failure on behalf of the executive however seeing the change and failing to act is shockingly poor. The points to take home are 1) disruption occurs (as described by Christensen) and 2) there are also two forms of disruption - unknowable and knowable. The unknowable type is difficult to defend against due to its unpredictability. So, in the case of APPL vs RIM then you can't really point the finger at the executives. It's just down to chance, a gamble and it's not surprising that companies get hit by this. Lapore is spot on regarding lack of predictability and post event classification with this form. However, the knowable form is highly defendable against - it is easy to adapt to this. That companies get disrupted by this is either failure of executives in terms of situational awareness or even worse a failure to act upon what is known. There isn't much of an excuse for this. I mention this because 'disruptive innovation' appears to have become a common excuse for company failure. In many cases, the reason why the companies were disrupted was because of executive failure to either see or act upon a visible change i.e. the storm was visible, they either failed to look or failed to move the company out of the way. This shouldn't happen but unfortunately it does.